For my Foodie Film event where we watched the movie, Big Night, I wanted to highlight Italian cuisine. 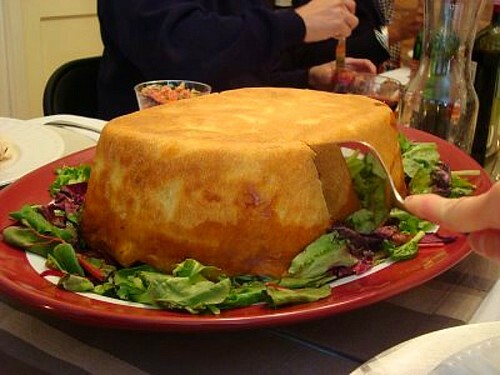 One of the signature dishes of the movie is a Timpano. A Timpano is an Italian baked pasta dish en croute. The name comes from the Italian word for eardrum or drum... but in relation to the movie, the name is given due to the vessel in which the pasta dish is baked in. A wash bin as large as a drum was used. Rather than using a wash bin, I looked through my kitchen to see what I had that could accomplish the end result I was hoping for... and it lead me to my deep stoneware baker. You could easily bake the timpano in dutch oven or even an ovenproof wok! After reviewing various recipes online for Timpano, I adapted the recipe from a book I checked out from the library, Cucina & Famiglia: Two Italian Families Share Their Stores, Recipes & Traditions. I also added a bechamel sauce since this dish reminded me of lasagna and I liked the creaminess the bechamel added to lasagnas I made. To make the dough, place the flour, eggs, salt and olive oil in a stand mixer fitted with the dough hook. Add 3 tablespoons of water and process. Add more water, 1 tablespoon at a time, until the mixture comes together and forms a ball. Turn the dough out onto a lightly floured work surface and knead to make sure it is well mixed. Set aside to rest for 5 minutes. Flatten the dough out on a lightly floured work surface. Dust the top of the dough with flour and roll it out, dusting with flour and flipping the dough over from time to time, until it is about 1/16 inch thick and is the desired diameter. Generously grease the timpano baking pan (a 6-quart container) with butter and olive oil. Fold the dough in half and then in half again, to form a triangle, and place it in the pan. Open the dough and arrange it in the pan, gently pressing it against the bottom and the sides, draping the extra dough over the sides. Set aside. To prepare the filling, have the pepperoni, mozzarella, meatballs, and bolognese at room temperature. Toss the drained pasta with the olive oil and bechamel sauce. Place half of the pasta on the bottom of the timpano. Top with half of the pepperoni, half of the meatballs, and 1/2 of the mozzarella. Pour 2 cups of the bolognese over these ingredients. Top with the remaining pasta. Top that with the remaining pepperoni, remaining meatballs, and half of the remaining mozzarella cheese. Pour 2 cups of the bolognese over these ingredients. Fold the pasta dough over the filling to seal completely. Trim away and discard any double layers of dough. Bake uncovered until lightly browned, about 1 hour. After 1 hour, cover with aluminum foil and continue baking until the timpano is cooked through and the dough is golden brown (the internal temperature will be 120 degrees F), about 30 minutes. Remove from the oven and allow to rest for 30 minutes or more. The baked timpano should not adhere to the pan. If any part is still attached, carefully detach with a knife. Grasp the pan firmly and invert the timpano onto a serving platter. Remove the pan and allow the timpano to cool for 20 minutes. Using a long, sharp knife slice the timpano as you would a pie into individual portions. 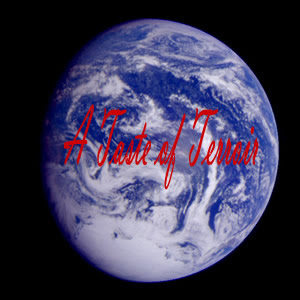 I've submitted this recipe/post to Anna's Cool Finds blogging event, Taste of Terroir. This event highlights unique foods and because this timpano is a dish that's served rarely in italian restaurants, I felt it should be highlighted. It certainly was the show stopper of my luncheon and I encourage others to give it a try! Check out Anna's blog for the upcoming round up! Oh my gosh, my husband would die if I made him that! It looks delicious! Looks like a great hearty Italian dish to serve a crowd. Yum! That could not look more awesome. My husband would die of happiness if I served him that! Holy cow I am so making this the next time I invite a big crowd over for dinner. It looks fabulous. For Christmas I made a Timballo, which was based on that recipe. If you get a chance, get it out on my blog. It was so incredibly delicious! That looks amazing! Sounds like it was a wonderful evening! OMG this sounds absolutely awful for you which means it has to taste SO good. YUM. For the love of all that is holy, that sounds like something I would love to try once but never again. While looking surpisingly yummy, my heart and thighs just couldn't handle that on a regular basis! haha. Never heard of it before, thanks for the visual! There are not words to describe how sinful and yummy this looks. I definitely want to add this to my list of dishes to make. It would be perfect for my Italian Christmas Eve Dinner. Very impressive! I have never seen one of these, but would love to try it. I don't even want to think about how long I'd need to make up for this one at the gym. This looks amazing and my friends would be so impressed if I actually made something like this. Something to aspire to. Whoa! That thing is beyond awesome! I bet everyone looooved that!